Recently, I’ve been taking on a major item that’s been on my checklist of must-read manga, Adachi Mitsuru’s Touch. * Though it’s not as popular in the States, it’s widely regarded as a classic in Japan. As usual, the conventional wisdom was dead-on and this classic has been a joy to read, bursting with old-timey summer atmosphere, gradually-blooming romance, and dust-covered baseball. I also noticed that several newer works I’ve read before this draw heavy inspiration from it. ** Picking just one chapter from the thirty I’ve blazed through so far was difficult. I ultimately settled on this one because, among other things, it rolls out a musical montage to no music. 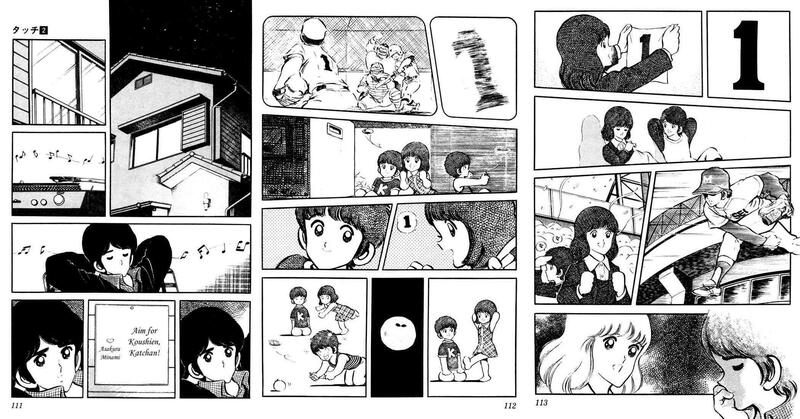 The key trait of manga by Adachi Mitsuru is that he writes stories that feature baseball but are fundamentally about love. Touch is a story more about a set of twin brothers, dedicated Katsuya and slacker Tatsuya, and the childhood friend who they both pursue. The series opens with the three in junior high, when Katsuya’s an ace pitcher, Minami’s a popular girl, and Tatsuya’s a lazy clown. As one might expect of two brothers who grew up with the same girl, Tatsuya and Katsuya are both in love with Minami. However, the depth of Katsuya’s affection was only really revealed in this chapter. In prior chapters, we got only passing indications that Katsuya was as interested in Minami as the story implied he was. Even in this chapter, he and she both faced inquiries as to whether or not they were actually going out, and both politely informed the people asking that they were not, in fact, an item. Minami’s feelings are still ambiguous where I am now. We get a window into Katsuya’s thoughts, however, when we see him listening to a record and having a particularly vivid daydream. This was a nice way of establishing that Katsuya was very much interested in Minami without needing to be overly complex or wordy about it. It’s a vintage piece of understated manga, really captures the spirit of young love. I could not be more excited to have hundreds more chapters of this to read right now. *The Pirates have been on an incredible winning tear in recent weeks, so my mood’s been all baseball. **The two most notable are Space Brothers’ “younger brother encourages older brother to achieve his dreams” relationship dynamic and Hajime no Ippo’s Mashiba Ryo character. This entry was posted in Chapter of the Week, Manga and tagged Adachi Mitsuru, Attacking the Backlog, Baseball Manga, Chapter of the Week, Classic Manga, DA BUCCOS, Daydream, Everybody Steals From the Best, Hajime no Ippo, Love Triangle, Manga, Space Brothers, Sports, Touch by torisunanohokori. Bookmark the permalink.